- Heat oil in a pan on medium heat. Add onion seeds and stir one second. - After one second add potato and mix well and cook 2 minutes. 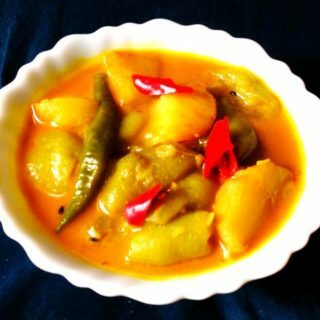 - After 2 minutes now add Turai/Jhinge/Ridge Gourd and mix well and allow it to cook until done. - Once potato and turai/Jhinge are cooked add salt, turmeric powder, red chili powder, green chilies and ginger paste and mix well. Don’t use water this time because Jhingli also released water. Sauté till combined well and raw smell disappears. - Add ½ cup water or just enough to make a thick curry (not very thick and not very thin). - Serve with roti or plain white rice.